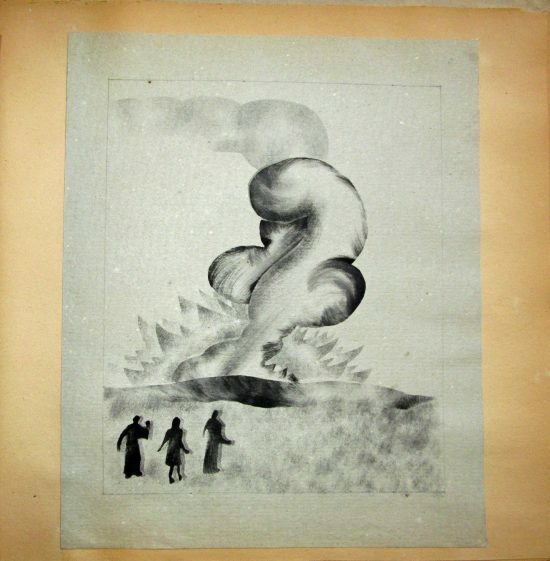 Editor’s note: Banning historian Bill Bell recently unearthed a rare trove of art inspired by exile. 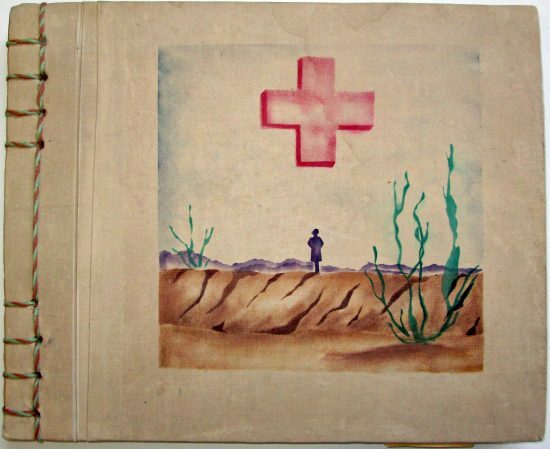 The hand-stitched scrapbook–poems, essays and linoleum prints–was made by high school students interned at the Poston Relocation Camp, three miles from the Arizona side of the Colorado River and north of Blythe. The internationally acclaimed sculptor Isamu Noguchi voluntarily moved to the camp in 1942 and may have helped to instruct the young artists. The scrapbook is discussed here by the man who found it. The Poston internment camp (officially called the Colorado River Relocation Camp) was constructed through the War Relocation Authority (WRA), a U.S. government agency established to create internment camps, the forced relocation and detention of Japanese Americans during World War II. The site on the Colorado Indian Reservation was selected by the WRA although the tribal council was opposed to locating the internment camp on reservation land, declaring they did not want to support the injustice of the camps. They were overruled by the Office of Indian Affairs and the U.S. Army. The WRA was created by Executive Order 9066, and signed by President Roosevelt on March 18, 1942, in response to the Japanese bombing of Pearl Harbor. Between 110,000 and 120,000 Japanese Americans were forced into ten internment camps (officially called “relocation centers”) across the United States. The Poston internment camp was the largest of all the internment camps in the United States at 71,000 acres. The peak population of the camp was 17, 814, making Poston the third largest city in Arizona at the time. Most of the inmates were California residents who were forced out of their homes, leaving belongings and livelihoods behind. 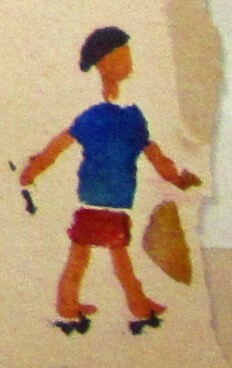 The scrapbook uses the term “evacuees” instead of inmates, although it was clear that the “evacuees” became inmates once they arrived at Poston. Poston was built on the Colorado Indian Reservation in Parker Valley, approximately 15 miles south of Parker and three miles east of the Colorado River, bordering California. 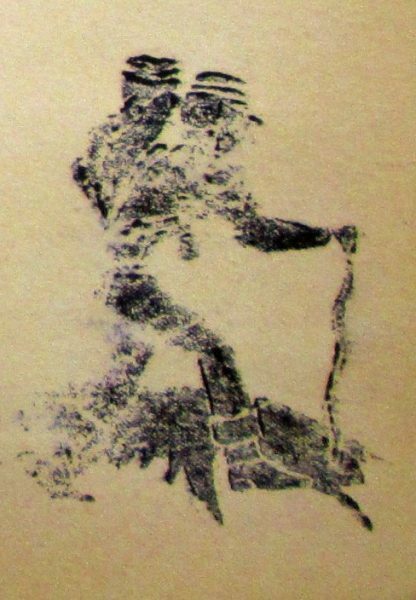 It was named after Charles A. Poston, an early pioneer settler in southwest Arizona. The same fear the American people understandably felt after the attack at Pearl Harbor was also felt by Japanese American families who were taken from their homes, carrying only a few necessities with them and facing an unknown future. They were loaded onto trains, not knowing where they were going or how long they would be there. To survive, most resigned themselves to a fate they couldn’t foresee. As they traveled toward their unknown destination a concentration camp was being constructed in the Arizona desert. The harsh climate in southwest Arizona made living conditions barely tolerable with hot and humid summers sometimes averaging 120 degrees, cold winter nights and frequent dust storms (referred to today in Arizona as “haboobs”). The replicated rows of barracks housing the internees were covered with only wood slats and tar paper. Several internment camp researchers have theorized that some of the internees were temporarily housed at the Banning Road Camp on their way to Poston. Even though this theory is plausible I’ve never been able to verify it through newspaper microfilm of the time period or Road Camp records. Within the climate of fear and war after Pearl Harbor many Americans felt the “relocation” policy was justified. 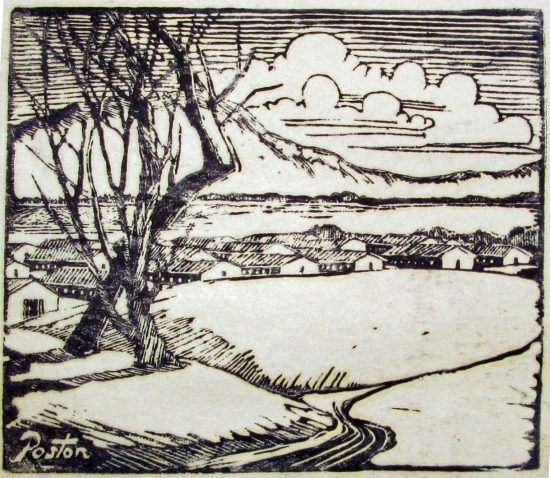 Others opposed the War Relocation Authority and Roosevelt himself was hesitant to implement it but the overall consensus of the citizens on the West Coast was to err on the side of protecting the population, regardless of any moral dilemmas regarding the incarceration of friends, neighbors and a race of people who were established, patriotic U.S. citizens. During the course of WWII ten Americans were convicted of spying for Japan. None of those ten were of Japanese ancestry. 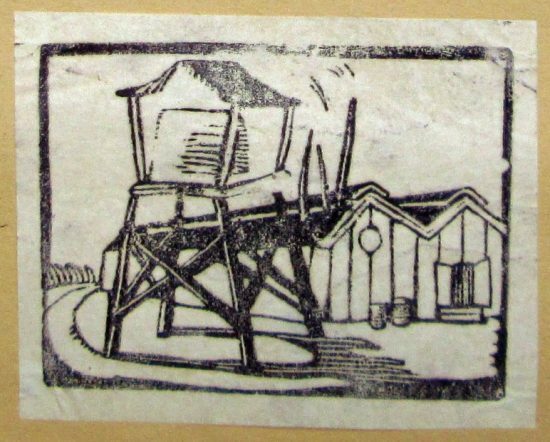 In 1988, the U.S. Congress declared that the internment camps were motivated by “race prejudice, war hysteria, and a failure of political leadership.” President Ronald Reagan signed a bill to recompense each surviving internee with a tax-free check for $20,000 and an apology from the U.S. Government. 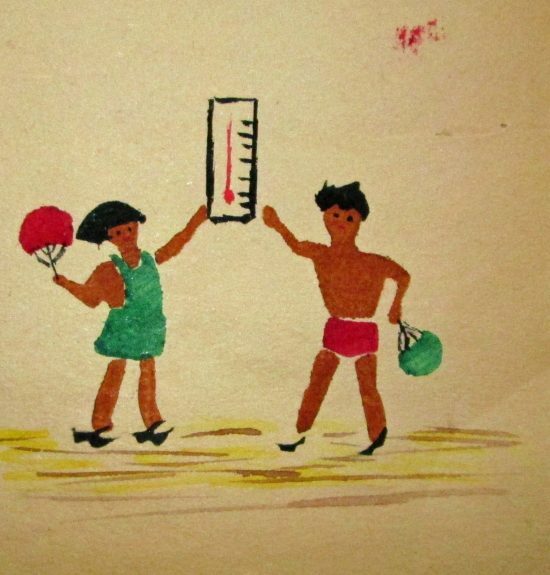 Many of the writings in the Poston scrapbook express fear that the internment program would become a permanent one. The students worried they wouldn’t be allowed to return home to California and if allowed to, wondered if they would be met with hostility and prejudice. Hiking to the Colorado River from camp. Betty Meltzer, local author, educator and historian, visited the Banning Public Library to view the Poston, AZ scrapbook. Betty is a Japanese-American who has first-hand experiences during WWII when she lived in Hawaii. After the bombing of Pearl Harbor her father was taken from her family and imprisoned in an internment camp on the island of Kauai. Betty is a member of both the Japanese American National Museum in Los Angeles and the Riverside chapter of the Japanese American Citizens League. 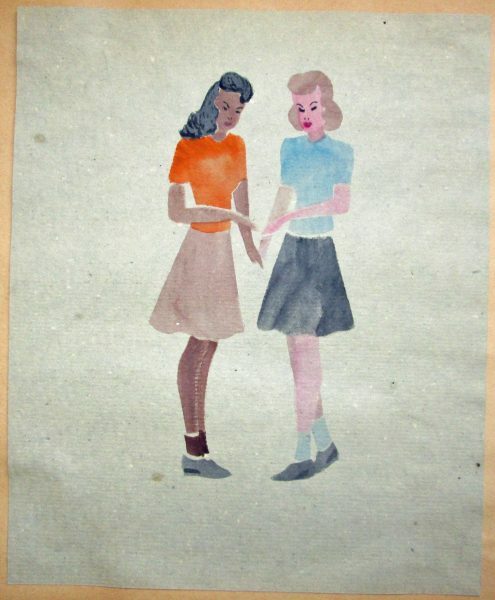 After viewing the Poston, AZ scrapbook Betty was moved by the art work and writings of the students who were incarcerated at the internment camp. Their experiences mirrored her own memories of what it was like to be a Japanese American in the early 1940s in the United States. “It is such a heartfelt document of life in an internment camp”, Betty observed. 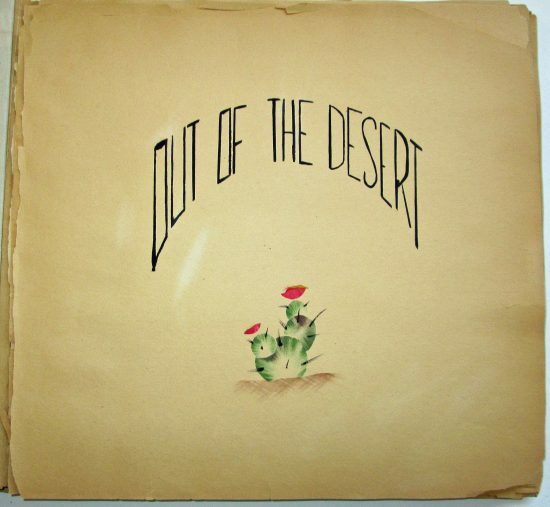 “The students must have literally scrounged for materials in the desert to express what they were feeling and make art prints for the scrapbook. 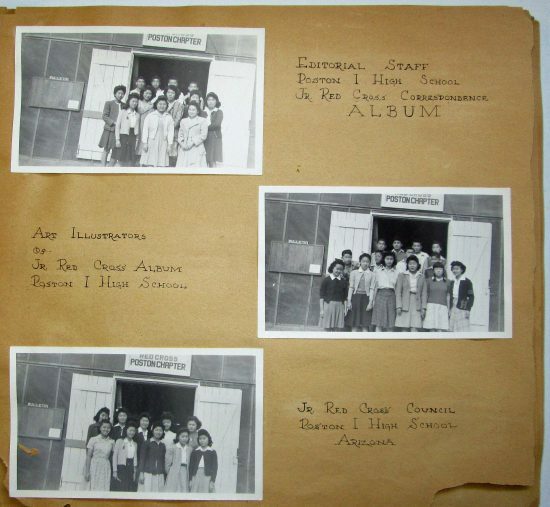 This scrapbook is very important for researchers to use in understanding life in an internment camp and it needs to be made available for those wanting to learn of the impact the camps had on Japanese Americans”. It’s unknown how many copies of the scrapbook may still exist. Thanks to an unknown donor this rare document will now be made available for the public to see and research at the Banning Public Library. A DVD has been created, along with a binder of the printed pages of the scrapbook. The actual scrapbook will soon be donated to an institution where it will be professionally archived and given more access to those researching Japanese Americans and the internment camps of World War II. The scrapbook from Poston, Arizona is more than a historic document. It is a living testimony to those who endured the darkest of times. Their spirits survived imprisonment and still leave trails in the sands of the desert. Somehow, amazingly, this Poston, Arizona scrapbook made its way along those desert trails and into the Banning Public Library. Bill Bell’s article originally appeared in the Banning Record Gazette. 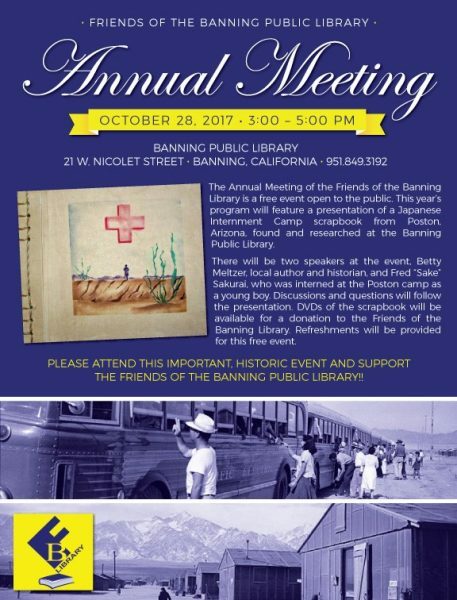 Bill will lead a discussion on the Poston camp with Betty Meltzer and Sake Sakurai (he lived at Poston as a boy) on Saturday, October 28, 2017 (3- 5pm) for the Friends of the Banning Library annual meeting. fascinating….beautifully pure, art within history. thank you for sharing dear ann. a “kind” rememberance of what we must remember. Amazingly complex art from a deeply troubled time. Thanks Ann.